Buy Whole Earth Organic Crunchy Muesli - 750g in the UK from our online shop or directly from our independent Scottish store. Whole Earth Organic Swiss style recipe, sublimely tasty muesli, made with flakes of oats and wheat, juicy raisins, seeds, sunflower oils, and crunchy hazelnuts. Whole Earth Organic Swiss style recipe, sublimely tasty muesli, made with flakes of oats and wheat, juicy raisins, seeds, sunflower oils, and crunchy hazelnuts. Organic. Dairy free. A high fibre food. Suitable for vegetarians and vegans. Free from artificial colours & preservatives. Our Italian wwoofer gave us this recipe while staying with us. It's a very healthy breakfast and so easy to make! This recipe requires no cooking! Raw and tasty. This recipe contains 1 tbsp unsweetened muesli. We sell real Whole Earth and other Breakfast Cereals directly from our shop in Scotland and online throughout the UK. View more products from Whole Earth. Where can you buy real Organic Crunchy Muesli safely online? If you are wondering where you can buy Whole Earth Organic Crunchy Muesli - 750g safely online in the UK, then shop with us. 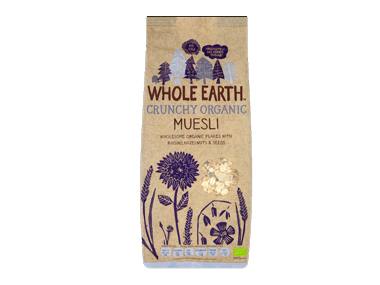 Organic Crunchy Muesli - Whole Earth Organic Crunchy Muesli - 750g in Breakfast Cereals and Rice, Grains & Oats.